For another architecturally rich visit in a quieter, smaller town beyond the hustle and bustle of Prague, is the town of Cesky Krumlov. It is 180 km. southwest of Prague –a pleasant train ride in old, but clean Czech trains. We stowed our bikes into the bike train car and settled into our seats to watch the green countryside roll by, dotted with red roofed farmhouses. As soon as one leaves the train station and rides into town, the preserved walls of the town begin to appear shortly and then you’re pedaling along cobblestone. The town was established in 1302 and ascended in its development to 1602. 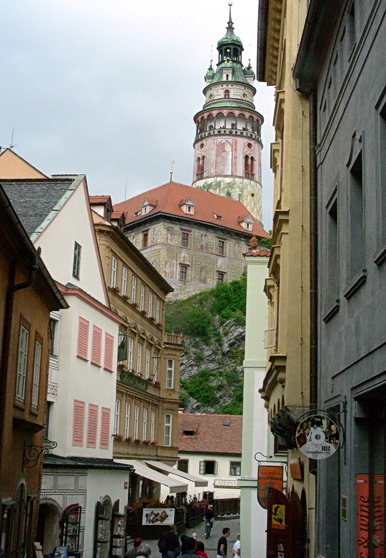 During this time period, Cesky Krumlov lay near the juncture of Czech, Austrian, Bavarian (German) and Italian lands. Our overnight stay was in a historic guesthouse, Castle Stairs which was tucked under the spire-shadow of the Cesky Krumlov’s Castle Tower. This was the same place where U.S. television travelogue broadcaster, Rick Steeves stayed. The owner also ran a souvenier gift shop downstairs. He generously allowed us to gingerly store our bikes inside the shop among some breakable knickknacks and glass display cases. If there was an alternate bike parking spot in this historic medieval section of town, we certainly would have used it! To explore Cesky Krumlov, we spent the rest of the first day, walking. 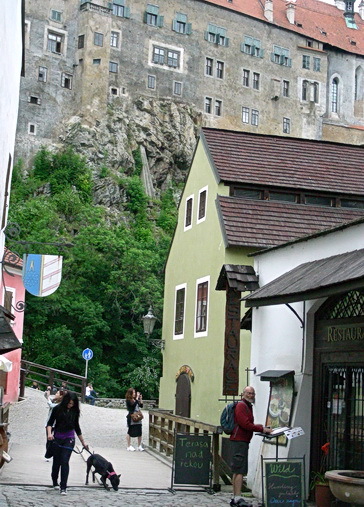 With the town split between an upper plateau level where the castle was located overlooking the lower level where the the townsfolk lived for centuries, it was just easier. Otherwise, we would be grinding up and shaloming down slippery, cobblestone streets. What was striking in the castle compound, was the use of trompe l’oeil on the building fascia and on the Castle Watchtower, or painted images to masquerade as bricks and stone. Now, to some visitors, this is cheesy but for a country like the Czech Republic, which already has numerous historic heritage buildings in Prague and elsewhere, it’s just abit more economical and practical. After all, when I wandered about Prague, I kept wondering how could the city sustain the long-term cost of architectural restoration even with support from other external funding bodies. The Czech Republic has only recently embarked enthusiastically on the road to free-enterprise. Within half a block of our guesthouse, there was a centuries-old, walled royal bear compound where yes, two bears roamed around. It was for the narcissistic pleasure of the royalty where ‘bear’ in part of the family name, Rozmburk (or Rosenburg, depending how you transliterate it) and featured in the town’s crest. After touring the castle, I couldn’t help but wonder it was a luxurious, but lonely life in this rural part of the country for the Rozmburks. An amble along the covered stone bridge down into the lower Cesky Krumlov, offered splendid panoramic views of Cesky Krumlov’s churches, neatly kept homes below, the Vtalov River, undulating green pastures and forests. Here, the bridge is on top of a Roman acqueduct. 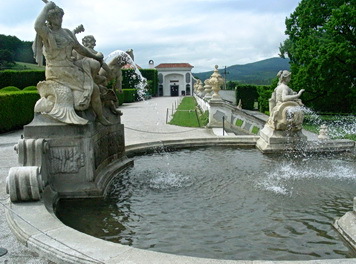 At the bottom of the castle, there were gardens and small fountains that mirrored very humbly to the more fabulous French Palace of Versailles-style gardens and topiary. Our meals were punctuated with gargantuous Czech dumplings that I wrote earlier in a blog post and the ubiquitous apple strudel. On the second day, we did some simple cycling around the edges of town before hauling ourselves and the bikes with panniers back onto the train. Strolling and exploring Cesky Krumlov.Czech Republic 2010. Photo by J. Chong. The town has 300 buildings as part of the UNESCO heritage designation. Cesky Krumlov offered us a relaxing, UNESCO designated historic ambiance of Czech expression for medieval and Renaissance architecture and art, in both high style as well as burgher style where shopkeepers, tradesmen and workers lived. It was seeing the best perserved slice of these architectural eras, outside of Prague. 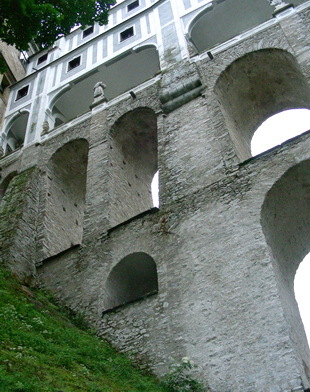 Cesky Krumlov’s official web site. Chong, Jean. Come and Get Your Dumpling: West-East Comparisons. In Cycle Write Blog, Jul. 25, 2010. 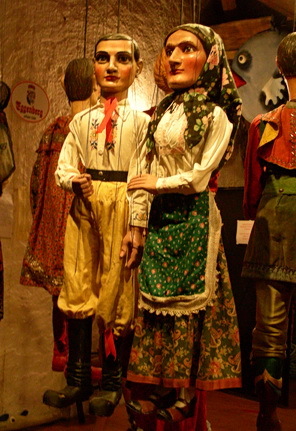 My wife and I went here on our honeymoon to the Czech Republic and Austria. Our stop at this gem was the highlight of our trip. 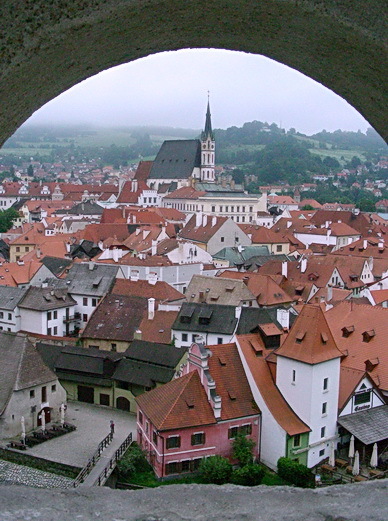 We too were delighted with Cesky Krumlov. Look forward to seeing what this surprise will be. Thanks for dropping by, Ann. What lovely images! The town looks beautiful. Thanks for dropping by. It’s a peaceful little town to spend a few days. Fantastic photos! They evoked my memories of visits to Prague and surrounding areas! I really like how your capture the ordinary lives in your pictures Jean! Love it.